God Wants You to be Rich...Really. You were created with a purpose and a plan – you are not just the result of random circumstances and people. God created you with intentionality and the sum of your gifts and experiences has shaped and refined you, leaving you with a unique opportunity to impact the world in a way that only you can. Of course not everything that has happened in your life is positive, but the Bible tells us that even in the midst of difficult people or devastating circumstances God is working everything for the good of those that love him. In the midst of dealing with these people or situations it is hard for us to believe this truth but I know I can look back and see how God used the difficult people and challenging times in my life to prepare me for what he had next. So with this thought the question to always have on our mind is this: Am I using all that I am to make the name of God known? Am I using my gifts, talents, opportunities, treasure, time, and talent as if it all belongs to God or am I using those things to pursue my comfort, my safety, my security, and my desires while sprinkling a little Jesus on it by giving him leftovers? Don’t be proud and trust in money, but trust God who richly gives us all we need. What does this look like? This looks like obedience to whatever God calls us to do. How many times do we have the opportunity to be obedient to the word of God but we don’t act because we convince ourselves that we just can’t afford to do that – that it wouldn’t be wise or prudent to give extravagantly because we need to make sure that we have enough to take care of ourselves if something unexpected happens. Do we believe it when the Bible tells us that God will provide all we truly need? Use your money to do good. We use our money for lots of things, but what priority do we place on using our money to do good? Do we even think about whether our use of money is doing good or doing evil? It is often a complicated question and I don’t have all of the answers, but how often do we think about the corporations and systems that our money supports when we spend it? Are we using our money to do good when we spend money on everyday low prices that support a corporation that treats their employees poorly? Are we using our money to do good when we buy a phone, a candy bar, a tomato, or a t-shirt that might have been produced by a slave or exploited worker? Are we using our money to do good when we spend 90% of it on what we need and we want while giving the last 10% to God when we live in a world where billions of people are living in extreme poverty? Be rich in good works, generous to those in need, and always be ready to share. What do you think of when you hear the word rich? To me it means having more than just enough – it means you have all you need and then some. Paul tells Timothy to encourage Christians to be rich in good works – not to do just enough to balance the scale, but do good works extravagantly. Do you know people like that? Do you live like that? 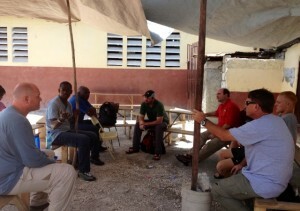 Each time I go to Haiti and visit Pastor Carlos I am given a new example of what this looks like. He serves his church, his community, the children in the OVC program, and he places their good ahead of his own. Then when my teams show up he treats us the same way. He serves us who are there to serve him. Pastor Carlos is most certainly rich in good works, generous to those in need, and always ready to share. So my challenge to you is this – examine your life and see if you are living out these commands. We are all in unique situations and places in life, so living this out will look very different over the course of your lifetime. Are you stockpiling the gifts God has given you as your security or are you being obedient to His commands and trusting that he will continue to provide for you? Are you using your money, and your time, your talents, and your influence only to create the life you have dreamed about or are you using it do good? Are you using your unique gifts, experiences, and location to be comfortable or to be rich in good works? Are you generous and ready to share all that God has given you or are you holding on to it tightly? I would love to hear your stories about how you are living out 1 Timothy 6:17-19. Feel free to post a comment! As part of World Orphans Mobilization Team, teams from the US continue traveling to Haiti, Uganda, Kenya, and more, and I never get tired of hearing about God’s work. It’s truly amazing to watch our Father, who knows each of us intricately, choose specific people “for such a time as this” (Esther 4:14). 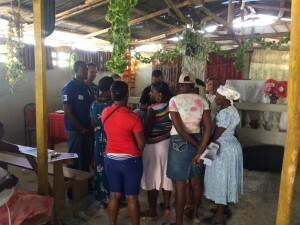 It was such a joy for me to sit and visit with Jayne as she relayed her recent trip to Haiti as part of a church partnership team, and I’d like to share it with you. I hope that as you read you will see God’s mighty hand, and that when He calls you, you too will go. I couldn’t help but think, “Yes! This team got it!” We’re no one’s heroes and we never will be. We don’t go to save or rescue anyone. As humans, our deepest need is for Christ and this is a hole that all the money, physical fitness, and even our most treasured relationships cannot fill. Jesus is the one that saves us from depravity, no matter the form it takes, and He is the one who makes us new, transforming us to live abundantly. Teams that travel from one culture to another must go in light of the Gospel, and as they do they recognize we are all equally helpless and finite before our loving Creator and in need of an all-powerful, all-knowing Savior. Oh yes! And equally loved!! I know first-hand that the Northridge team went well equipped with extremely talented, loving, humble women. 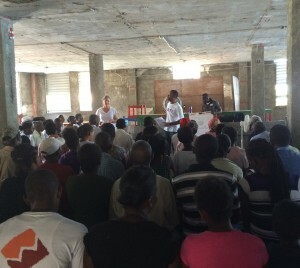 And as they put down their own needs and desires throughout the trip, God used them in powerful ways to help empower His loved ones in Haiti to be the extending arms of the Haitian church to families in the community. And in turn, they too were loved, changed, empowered, and helped. In her time there, Jayne didn’t just engage her hands and feet, but her heart. Since returning she’s been learning and diving into anything she can get her hands on about Haiti. She is brainstorming about how relationships formed throughout the trip can be built through letters and future visits. The two churches know that they are family. Praise the Lord! Maybe you’re being called to knock on the door of your next-door neighbor’s home; maybe you’re being called to pray for the hurting and displaced in Iraq; maybe you wake up everyday and are called to love your family well. Whatever God calls you to, now and in the future, I pray you will always go in light of the Gospel with arms of love and humility. 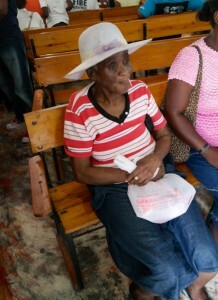 Thank you for journeying with Jayne and me to Haiti and back by reading this blog! I trust you enjoyed the ride as much as I did. What about you: To what is the Lord calling you? How have you seen Him work when you’ve been willing to act on his calling, big or small? “Whoever finds their life will lose it, and whoever loses their life for my sake will find it” (Matthew 10:39).